Gallery Hours: Thursday - Sunday, 11am - 5pm. OPENING RECEPTION: SATURDAY, OCTOBER 12, 5:30PM-8PM. “Our first breath comes from the most remote past; our last still owes it its warmth.” Reb Salinas. 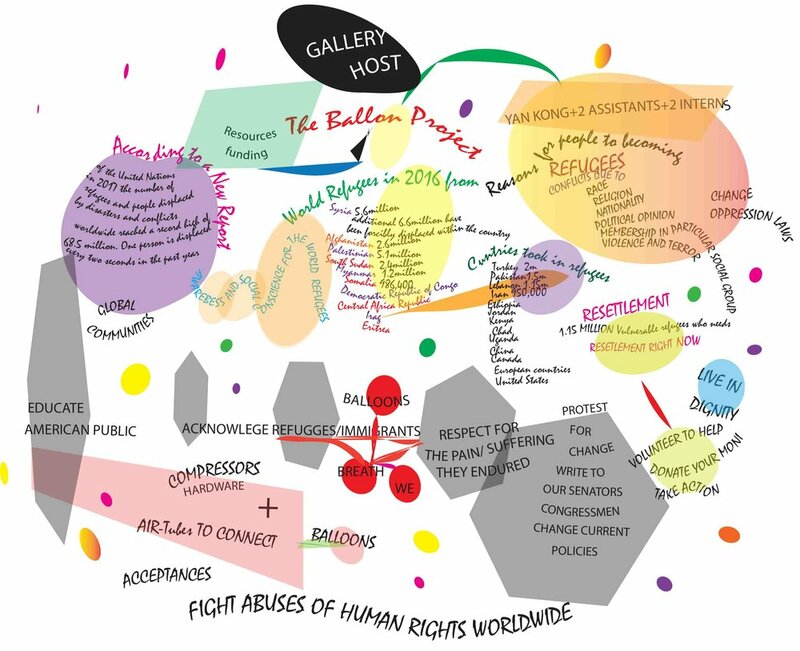 The Balloon Project acknowledges the suffering endured by the migrants and refugees; and of people who suffered the loss of friends and kin from political traumas. It pays tribute to those who perished from political persecutions around the globe; from racial violence and the random killings happening here in America. Let the breath of the woeful dead settle like a blanket of conscience around all politicians’ necks! The collages were out. While looking at the white balloons, the white supporting tubes, the white cover cloth beneath and the white wall, I wrack my brain to come up with something that could be visually exciting in the presentation. I thought it is a three dimensional canvas. How do you paint a canvas like it is. The next thing I found myself doing is setting up my video projector. Yes! Play a movie over this white background. I found lots of videos about the migrants and refugees in Youtube. I experimented. The result was amazing. The video as it played it colors inflating/deflating balloons. I yet have to get permission from the media to have license to use these videos. I cannot use these videos as part of my exhibition presentations. However, here are a few images.. I think this is it. The best visual presentation of the Balloon Project so far. I am committed to this. Now the job remains for me is to produce my own videos. The visual effect of the 32 balloons posted January 9 has a small but uncomfortable problem. The balloons were looking like Cheerios. A bit too cheerful for the ideas they are to represent which is refugees and migrants fleeing for their lives with battered breathing. I experimented with different color scheme. All the balloons are now white with a few transparent. Supporting tubings are painted white. the cover cloth beneath is white. I visualize that the balloons would blend in - white balloons, white tubes, white cloth and white wall. They will just float and suspend in the air, pulsating with air. A week’s work has proven that the balloons are stubbornly rooted with the white tubes. Perhaps I do not know how to light the area because these balloons did not float and suspend as I had hoped for when inflating and deflating. The balloons presentation was rigid and static. Functional settings at this stage are: The Lenticular Valve to the air-source pneumatic tubings are set at quarter turn to allow air stream-in slower and a bit less forceful. The blue airflow valve are set straight to fill front and end balloons at once in beginning, then a quarter turn to allow even distribution of air for front and end balloons. Regulator for air signal is 20psi. Regulator for air source is 60psi. Timer setting for first 16 balloons is 5sec in/2 sec out; for the 2nd set of 16 is 4sec in/ 3sec out. Stay tune for March. Here is the blinking light bulb. The balloons would be in color again. We will have a guerrilla force working to make floor to ceiling collages with images of refugees and migrants embellished with color paints. The balloons would be in colors. Tubings would be painted with colors. The covered cloth and part of the floor would be a colorful collage also. The goal is to have the balloons floating and suspending in the air within a consuming colored stage. The boxes that were made to house the balloons were abandoned for shorter interconnecting air passages since the boxes had created longer air passage routes and had taken too much air supply leaving less air for the inflation/deflation for the balloons. The new configuration for the 16 balloons using tighter and closer connections between balloons was more efficient and lesser taxing on the compressor. 60 gallon tanks will run the 16 balloons for 16 minutes at 40 psi and a separate regulator at 20psi for the air flow for air signal timing device. The Balloon Project in Progress. 16 balloons. Compressor 60 gallons tank, 3.5 HP, 220V. The 60 gallons full tank will run at 40psi using a regulator for 12 min. The inflation/deflation of balloons at 4 sec in 3 sec out. Fantasizing running the balloons like in a circus with a monkey peddling a bike that channel air into the balloons. If anyone knows the mechanic of doing this please email me. It’s the same principle of a motor running the Ferris Wheel. A stationery bike with an electric motor would work similarly. Talking out loud and throwing ideas in the air. Support the Balloon Project by making a donation. Thank you.